When a friend bought me some delicious pumpkin spice caramels from Godiva, I immediately thought about these cupcakes. 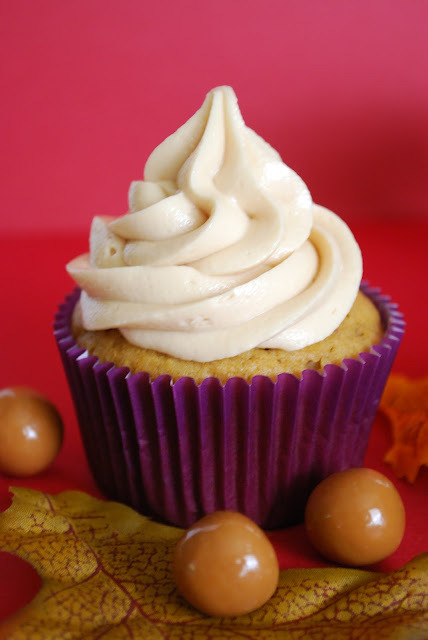 The combination of pumpkin and caramel is amazing and I wanted to do something other than cream cheese frosting. Don't get me wrong. I LOVE cream cheese frosting. I would eat a piece of cardboard if it had cream cheese frosting smeared all over it. I just thought this caramel buttercream would be a nice change..and it was. Preheat oven to 350°F. Take paper liners and line muffin tins. Combine the flour, baking soda, baking powder, salt and spices. On medium-high speed with an electric mixer, cream the butter and brown sugar until light and fluffy. Add eggs, one at a time, beating until each is incorporated, scraping down sides of bowl as needed. Reduce speed to low. Add flour mixture in three batches, alternating with two additions of buttermilk, and beating until just combined. Add pumpkin; beat until just combined. Divide batter evenly among lined cups, filling each three-quarters full. Bake, rotating tins halfway through, until golden brown, 15 to 18 minutes. Transfer tins to wire racks to cool. Place cupcakes onto racks and let cool completely. From So How's It Taste? In a medium saucepan over medium-low heat, melt the caramels, stirring often. Remove from heat and stir in milk until smooth. Set aside and cool to room temperature. In a medium mixing bowl, cream together the butter, powdered sugar, and vanilla for 3 minutes on high. Add the cooled caramel and mix on high for 2 minutes. Frost cooled cupcakes. Oh my goodness! You're killin' me with all these pumpkin desserts! Caramel Buttercream?! Yes please! I just make pumpkin cupcakes last week, but now I need to make them again!! !